Home » Listings » 419 Rialto Ave. 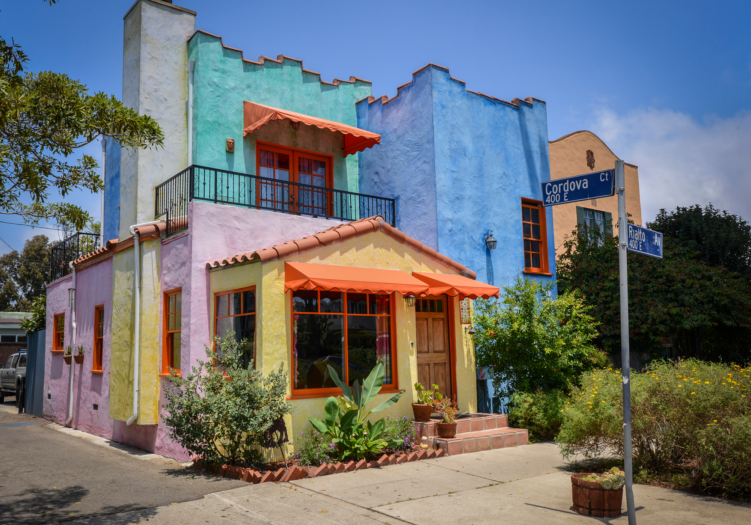 Explore the wonders of Casa Cordova – a landmark on Rialto Ave. inspired by the Colonial era homes of San Miguel de Allende in the Mexican state of Gunajuato. The multi-color stucco exterior, clay tile trim, wrought iron balconies and heavy wood front door are reminiscent of the past but fit in perfectly with Venice’s artistic environment of today. The theme of color continues in a well-lit and airy interior open floor plan including a convertible third bedroom that can be closed off for guests, used as an office or more living space.A spacious second story master bedroom with pine floors has a walk-in closet and French doors leading to front and rear balconies. The adjoining bath has window, skylight, Jacuzzi tub and Mexican tile shower, double sink counter and good storage. A one-car garage with skylight has been converted to a studio. On-site parking for one large car or two small cars. In 2000 75% of the house was rebuilt with new foundation, updated plumbing and updated electric.